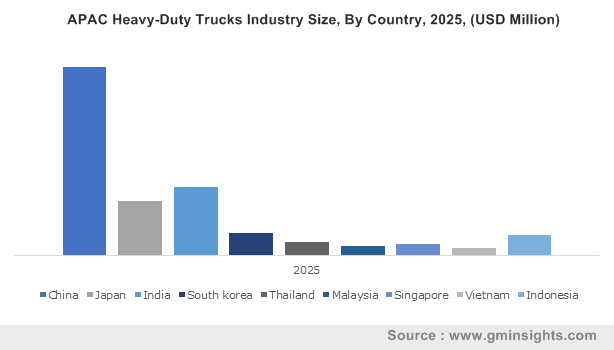 Heavy-Duty Trucks Market size valued at over USD 120 billion in 2018 and is estimated to exhibit around 4% CAGR from 2019 to 2025. Increasing freight transportation demand owing to proliferating economic conditions and globalization across the globe are positively influencing the heavy-duty trucks market share over the projected timeframe. Growing domestic and international trade activities are providing potential opportunities for the expansion of business operations globally. Rapid industrialization is resulting in large scale production and distribution of goods further generating the demand for expanded transportation fleet size. Changing trade policies coupled with improvements in logistics and supply chain management are propelling the heavy-duty trucks market share. 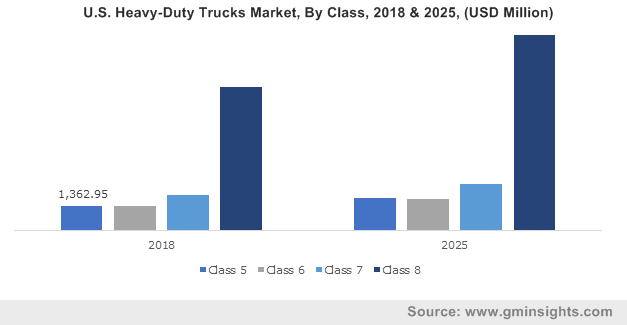 Increasing consumer inclination towards utilizing vehicles equipped with advanced driver assistive technologies and safety features are playing a major role in intensifying the heavy-duty trucks market size over the forecast timeframe. Rising customer demand for goods featuring higher value to cost ratios is significantly contributing towards the increasing freight shipments and volumes. Proliferating e-commerce industry in conjunction with improved distribution network are providing a positive outlook for the industry growth. Surging demand for vehicles offering higher payload carrying capacities intended for construction and mining applications will provide potential growth prospects for the heavy-duty trucks market size. Introduction of advanced connectivity solutions such as smart fleet management and common telematics platforms are positively inducing the adoption of modern heavy-duty trucks. Incorporation of smart communication networks including Bluetooth and GPS connectivity are prominently enhancing the logistics operations and reducing transportation downtime. For instance, in 2017, Freightliner introduced new Cascadia equipped with Detroit connect suite technology, offering interactive reports of fuel efficiency performance and safety characteristics. Supportive government initiatives and policies targeted towards development of lower emission heavy-duty trucks are driving the industry size over the study timeframe. Government authorities such as the California Air Resources Board, Ministry of the Environment (MOE), Environmental Protection Agency, Truck Industry Council and European Commission are striving to develop performance-based standards for reducing the overall environmental impact. For instance, in May 2018, the European Commission introduced a legislative proposal for setting of newer CO2 emission standards for heavy-duty trucks. Stringent regulations and standards pertaining to carbon emissions may restrict the heavy-duty trucks market share over the forecast timeframe. Higher ownership and maintenance cost associated with the vehicles may further hamper the industry size. However, manufacturers are deploying lean manufacturing processes and providing vehicle leasing facilities, thereby further encouraging the product adoption over the projected timeframe. Increasing prominence of Class 5 trucks owing to its lower operating cost and enhanced fuel efficiency are propelling the segment growth over the study timeframe. Deployment of such trucks in logistics and construction activities featuring higher power and torque capabilities along with advanced electronic control systems are further augmenting the segment growth. Significant improvements in safety and load carrying capacity of such trucks are further contributing towards enhanced operational productivity. Higher load carrying capacities coupled with optimum performance and long-haul traveling capabilities are escalating the Class 8 trucks growth over the study timeframe. Increasing investments in mining and construction projects are supporting the heavy-duty trucks market share. Incorporation of advanced features such as intelligent driver information and navigation systems along with higher adoption of driver assistance systems including Android Auto and Apple CarPlay are supporting the segment growth over the study timeframe. Additionally, promotional deals offered by industry participants for increasing truck sales are encouraging consumers to adopt such trucks, thereby positively influencing the market growth. For instance, in March 2017, Kenworth announced the construction and chrome program offering USD 1000 discount on purchases of new Kenworth T880 model trucks. Higher torque and fuel economy offered by diesel powered trucks will primarily drive the segment growth. Presence of numerous fuel refueling stations coupled with relative lower diesel prices are positively influencing the segment growth over the forecast timeframe. Moreover, introduction of newer models and variants at diversified price range with varied power and torque output are strengthening the segment share. For instance, in April 2018, Freightliner introduced the new EconicSD equipped with 350 HP diesel engine and variable cam phasing technology. 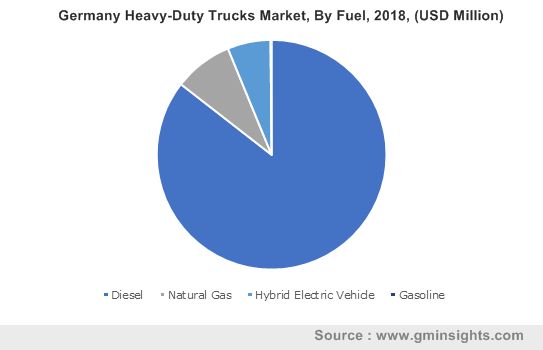 Growing prominence for reducing greenhouse gas emissions coupled with increasing electrification in transportation sector are providing a positive outlook for hybrid electric heavy-duty trucks market expansion. Stringent carbon emission regulations and norms are prominently augmenting the sales of hybrid electric vehicles over the study timeframe. Increasing deployment of hybrid electric vehicles is attributed to the growing demand for replacement of non-renewable energy resources, thereby strengthening the heavy-duty trucks market size. Agriculture segment will witness significant growth from 2019 to 2025 owing to rapid deployment of heavy-duty trucks offering high traction and enhanced manoeuvrability for carrying products safely over long distance. The requirement for lower emission and fuel-efficient engines trucks for specific applications such as organic farming along with higher load capacities requirements will further escalate the segment size over the projected timeframe. In 2018, logistics accounted for over 35% share in the heavy-duty trucks market size owing to rapid industrialization and proliferating trading activities across the globe. Collaborative business strategies to expand the existing distribution networks and increase freight volumes will positively impact the heavy-duty market growth till 2025. Increasing digitization and connectivity solutions for heavy-duty trucks along with increasing sales from online portals are providing potential opportunities for the logistics segment over the study timeframe. Asia Pacific heavy-duty trucks market size is expected to witness around 4% CAGR over the forecast period. Proliferating sales coupled with strong presence of manufacturers across the region are propelling the industry share over the study timeframe. Easier availability of low-cost manpower and raw materials are further stimulating the construction and agricultural industry, thereby supporting the heavy-duty trucks market share. Europe heavy-duty trucks market size is expected to grow significantly over the projected timeframe. Increasing adoption of advanced technologies providing improved vehicle performance and operational flexibility are contributing towards rising vehicle demand. Favourable government policies are encouraging the development of fuel saving technologies, along with rising preference for green mobility solutions such as electric and hybrid powertrain are further expanding the industry share. 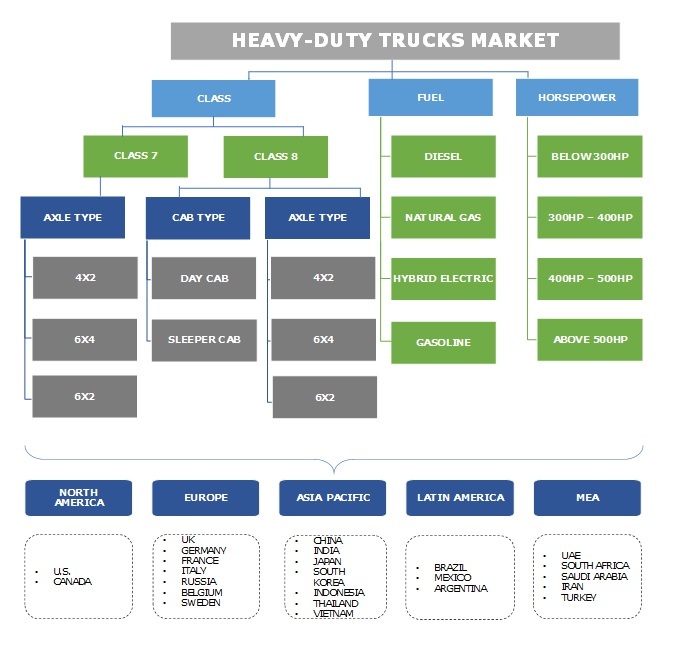 The global heavy-duty trucks market is highly competitive owing to the presence of major manufacturers including Daimler Group, Dongfeng Motor Group Company Ltd., Eicher Motors Limited, Ford Motor Company, Navistar, Oshkosh Corporation, Paccar, Tata Motors, Volkswagen and Volvo. Popular brands showcased by these manufacturers include Freightliner, Kenworth, Peterbilt and Scania AB. Manufacturers are engaged in developing effective relations with their suppliers for ensuring timely delivery of their products in the market place. For instance, in December 2018, PACCAR Inc. recognized the top performing suppliers under its Supplier Performance Management (SPM) program, thereby encouraging other suppliers to offer higher quality products. Industry participants are also focusing on developing innovative powertrain technologies for enhancing the overall fuel efficiency and life cycle of the heavy-duty trucks. Strategic acquisitions and collaborations are prominently contributing towards increasing revenue generation and expansion of global reach. For instance, in May 2015, Volvo completed the acquisition of Dongfeng Commercial Vehicles Co., Ltd, manufacturer of heavy duty and medium duty vehicles. Heavy duty trucks are utilized for transportation of goods with several applications platforms comprising agriculture, logistics, construction, and mining. Technological advancements in conjunction with stringent regulatory norms are enabling industry players to adopt alternative technologies and powertrains for powering such vehicles. The prevalence of numerous truck service providers focussing on expanding their truck fleet along with improvements in truck efficiency are further expanding the market share. Rising prominence of internet along with proliferating shopping and marketing from online portals with improvements in e-commerce activities are gaining prominence in the market place.